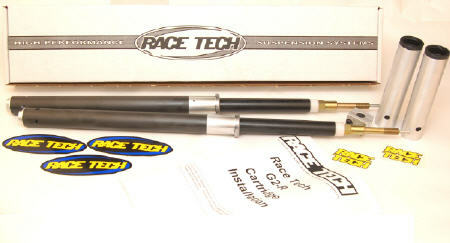 G2-R 25mm Cartridge Kits replace the stock damper with a high-performance unit. Each set is custom built to order for the application and valved to the rider's specs, preference and ability. Used in the winning AMA Vance & Hines XR1200 Road Race Series. These Cartridges are not just for Sport & Race Bikes. They are also available for Adventure, Sport Touring, Cruiser, Dual-Sport as well as any application where extraordinary suspension performance is desired. Check out the head-to-head shootout of G2-R Cartridges vs. Öhlins in ►"Sport Rider Magazine". "I believe this is one of the best performance modifications you can purchase."